The Polish enter the International 505 class as builders for the first time. The 505 fleet has another builder, the Polish have produced a new derivative with a few modifications. Mainly an offset port-side spinnaker chute, copying the US teams of the 1980’s out of the Larry Tuttle (Waterat)/Lindsay shop. The overall design is remarkably similar to the Rondar but has (probably) been substantially influenced jointly by Jan Saugmann the twice Int. 505 world champion. I sailed against Jan in Australia back in 2011 and he is very tactical on the 1st windward leg, always looking for clear air and climbs very high with speed when he can, so I can see where he is coming from. As the world’s fleets get bigger again 150 plus, it is vital to be in the top 20 at the windward mark otherwise you are dead in these predominately drag race upwind and gybing reaching legs. The offset chute enables two things, a slightly lighter bow (not much by the way), but more importantly the ability to move the jib tack, much further forward, Steve Benjamin (USA) the 1980 world champion used this method very successfully (with bags in those days – but Steve came from the 470 class so was well equipped to handle the spinnaker (being quite small back then)). This means you have more apparent sail area on the wind, so potentially providing much more power up-wind, if you can control the slot. If done right you are gone probably gaining 50/100 meters or more by the 1st windward mark. Also considering the 1st launch now is 90% on an initial starboard reach (because of the windward offset separator-mark for the first turn), then your 1st rounding is almost free of charge and considering you are only going to launch for 3 more times during the race, the risk of a gybe launch is fairly limited. The only other problem that you may encounter is dropping the windward guy under the boat, this is a killer and ultimately non-recoverable without much disturbance. To counter this it’s generally recommended to put a 6″ wire/rod catcher on the bow to pick up the dropping loose guy. After this major difference there is the usual comments on a finer bow and flatter stern in-common with the new Ovington the boat has a traditional deck-lines and tight forepeak. 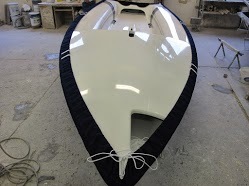 A carbon jib aperture that sticks out into the boat a little further forward than normal for the bow jib forestay, so the slot angles and leech tensions can be altered. The boat is fairly empty in the middle with not much support around the mast gate and centerboard case, so there may be some movement here and a weird stern dip in the transom and the same (possible) problematic hull and deck joint inherited from the Rondar’s of the past. The boat’s entrance into the 2014 world’s in Kiel will be interesting, the event can have variable wind ranges, the German’s will be mainly in new Ovington’s from Holgar and with a likely massive turnout, anyone having a chance to put some air between them and the rest of the fleet on the 1st leg has some chances. Personally the German’s may work the fleet to their advantage and don’t be surprised if Wolfgang Hunger picks up his 6th world championship title. How much is an Ovington Jess boat? I see he puts lots of fittings on- what does his bare boat to your bare boat compare? Shipping to Europe for a Parker? I think a complete Ovington/Jess boat is around 30,000 euro, but I don’t have his price list. I am not aware of his bare-boat price, but if you are in the UK I suspect you can buy direct from Ovington. Our prices are clearly indicated on our website, our extras are in our price list, please let me know if you would like a copy. Shipping to Europe varies, please let me know an approximate location and then I can provide a better approximation. 9108 hits the water, with a little history behind the design. Congratulations to Mike Holt and Carl Smit – great achievement in being the 2015 International 505 world champion’s. Who will win the South African International 505 world’s.